The haggis is widely believed to be a Scottish delicacy (and I use the term loosely) made from a sheep's stomach stuffed with wheat and barley, among other things. However, rumors persist of the haggis in fact being a small furry animal native to Scotland. A strange and eerie sound drifts slowly down the glen, uisge beatha! uisge beatha! The sun is peeping over the horizon but none can feel the warm rays through the swirling mist. The men are huddled by the traditional "siggah" rock, chanting and taking turns at the cask with the warm golden water of life. Suddenly, a tracker appears on the heathery slope and calls "haggi! haggi!" 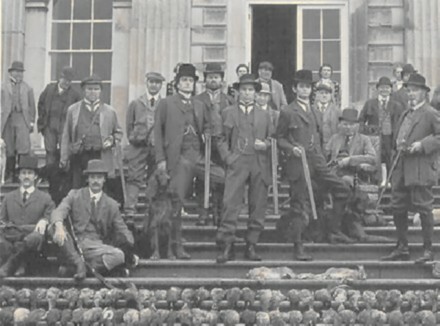 In a flash, the men are up and running, spreading out in the ancient hunting pattern which each had learned as a boy. Catching a wild haggis, in these days of scarcity, would make a living legend of the team involved. 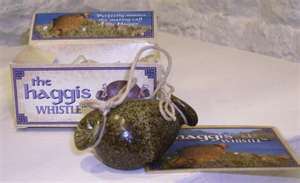 A haggis whistle is used to attract the animals. The most difficult part of the ancient art of haggis hunting is actually locating the beast and then chasing it in the right direction. The haggis has evolved to be just a bit faster than the fittest man and more sure footed than a mountain goat. It runs along the hillside using its two long legs and the one short leg to maximum advantage. Once it slips through the hunting line it can be gone into the gorse in a flash. 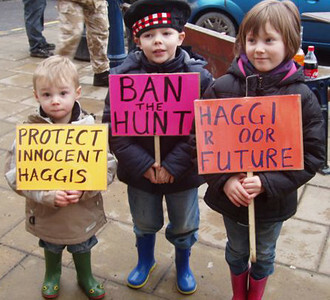 The hunters must keep behind and on the uphill side so that the haggis is gradually driven down to lower ground. This can take over three hours, but once the critter is down on the glen floor the advantage swings quickly in favor of the hunters – because of its uneven legs the haggis can only run in circles when on flat ground. As soon as the hunters see a haggis circling in this fashion they surround it, and bring up the cask for celebratory refreshment. Within about twenty minutes the haggis can be found lying flat out through dizziness and exhaustion. Soon after that the men are usually found lying flat out around the haggis, with an empty cask rolling amongst them!